The Gill and Wawne families were among the earliest residents of an area a few miles southwest of Bronaugh. In fact, they had lived there and many of them were gone by the time the town of Bronaugh was founded. It appears that there may have been two separate Gill families and we have yet to figure out how they may or may not have been related. William Gill was a wealthy landowner who had been born in England in 1803. He and other relatives immigrated to the United States as young adults. He was living in Illinois by 1839, when his son, John, was born to his unknown first wife. In 1842, William married Malinda Curry, a native of Kentucky. In November 1843, their first child was born - James Curry Gill. The family continued to live in Illinois, appearing in census records for Maucopin County, Illinois. At least part of the time, William and his family must have lived in Vernon County, Missouri. 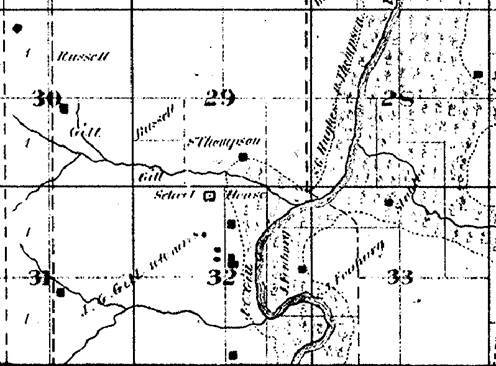 The plat map to the left was shared by Nancy Thompson from the 1876 Vernon County Plat Book and shows sections 18 - 33 of Vernon County. You can see the Gill family owning land in sections 29 and 30. It also shows J. C. Gill owning land in section 32. Note that the Gill School is located in section 32. J. C. Gill refers to James Curry Gill. He married Ella Walton in 1865 in Illinois. Their children included, William, born 1866 in Illinois; daughter Jessie Gill, born in 1868 in Illinois; son Frederic Gill, born in 1875 in Missouri; and son Rolla, born in 1877 in Illinois. These children and dates are from the 1880 Vernon County census, which verifies the family living there at the time of the 1880 enumeration. From this we can make some assumptions. First, it appears that the family went back and forth between Vernon County and Illinois. That would have been challenging at that time because there were no railroad lines through that part of Vernon County. The rail line from Nevada to Bronaugh was not laid until about 1886. So the family would have to go to Nevada or some other larger town such as Ft. Scott, Kansas, by horse and buggy to get on a train to go to Illinois. Another assumption that we might make is that there was a child or two lost since there is a gap in birth years between 1868 when Jessie was born and 1875 when Frederic was born. If they were living in Vernon County during those years, then there would have been a need for a cemetery. Gill Cemetery is on the corner of the J. C. Gill property, so one might wonder if there are un-named Gill children buried there (this is just speculation). This plat from 1886 Vernon County, shows that by that time, John Curry Gill was not listed as the owner of land in Vernon County. Instead, the land he owned in 1876 was owned by William Gill, his father. Note the error in this map - it shows the school in the middle of section 30 rather than in section 32 as shown in other plats - both earlier and later. James C. Gill had been reared and educated in Illinois, attending Bunker Hill Academy and McKendrie College. He began farming with his father in Illinois and removed with him to St. Louis, but returned to Illinois and later removed to southwestern Missouri, where he engaged extensively in the sheep and cattle business. He was secretary of the State Wool Growers' Association of Missouri for some years, and was also state lecturer for the State Grange of Missouri. James C. Gill and his family had moved to Cass County, North Dakota, in 1882, and settled in Gill Township, on section 35, where he farmed till his death..
John C. Gill assisted in the organization of Gill Township, Cass County, ND. He was elected county commissioner and served four years, and was chairman of the board. He was president two years of the United Farmers of North Dakota, and was instrumental in the organization of the Wool Growers' Association of North Dakota. He was elected to the lower house in 1891, followed by his re-election in 1894, and then he served as speaker during the season of 1895. He was chosen secretary of the state senate in 1897, and was performing those duties at the time of his death. Mr. Gill died at Bismarck, North Dakota, January 30, 1897, and was taken to his home in Cass County for interment. All five of his children were residents of his home county at the time of his death. By 1880, William Gill was back living in Bunker Hill, Macoupin County, Illinois. He was widowed by that time. Living with him was his sister, Charlotte Gill Wawne. William was age 77 and Charlotte was age 70. However, not long after that census was taken, William Gill (perhaps), his sister Charlotte Wawne, and her daughter Fannie Wawne, were in Vernon County, Missouri. This is known because Charlotte Gill Wawne, died there on October 27, 1882, at the age of 73 years. She was buried at Gill Cemetery, which was on the corner of William's large farm. Strangely, Charlotte's daughter, Fannie Wawne died two days later on October 29, 1882, at the age of 35 years, 8 months and 12 days. It would be interesting to know the cause of their deaths, that were so close together. Charlotte had two brothers, William Gill and David Gill who also emigrated from England, moving eventually to Morgan County, Illinois. Both farmers, William was extremely successful (property worth $20K in 1860 with 10 hired hands.) David was not so fortunate, apparently. Richard and Charlotte Wawne had four daughters and one son. Two daughters, Maggie, and Mary Jane, moved north through the Hudson Valley in New York state and married. Maggie died of "consumption" in 1869. Maggie had married Martin McNary (1837-1934) in 1861. Martin and Maggie had three children by the time she died in 1869. She was buried next to her father in Hudson. Two daughters of Richard and Charlotte, Sarah E. (Sally) and Fannie and the son, Charles, moved West to Illinois with Charlotte sometime after 1860, the women living alternately with Charlotte's brother William Gill and Charlotte's son Charles Wawne. Sally had married a George H. Anderton, a farmer in Franklin, Morgan Co., IL. Fannie appears to have been her mother's caretaker and never married. There is an eight year gap between the births of Mary Jane and Maggie which probably indicates that a child or two were lost during the interim while they were living in New York. Since Charlotte was shown living alone with her children in the 1850 census, it probably indicates that her husband, Richard Wawne, had died while she was pregnant with son Charles, who was born in January 1850. Donald also shared this great letter from 1884 that was written by Sarah Wawne Anderton to her sister, Mary Jane Wawne Hoffman (who was married to William Hoffman). From this first page, we can glean some good Vernon County information. 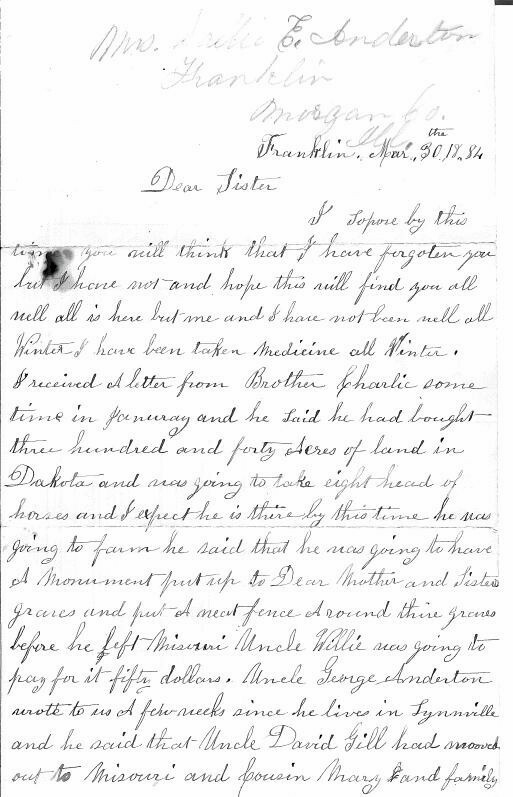 She mentions that she had received a letter from brother Charlie (that would be Charles Wawne, born 1850). He had been in Vernon County, but he was leaving to go to the Dakota's where he had bought 340 acres. He was taking eight horses with him. The letter tells that he was going to have a monument put up to "dear Mother and Sister's graves" and put a fence up around their graves before he left Missouri. Then it says that Uncle Willie was going to pay $50 for it. This refers to burials in Gill Cemetery for their mother Charlotte Gill Wawne and her daughter (their sister) Fannie Wawne and shows that William Gill paid for the monument. The letter then tells that Uncle George Anderton had written and told them that uncle David Gill had moved out to Missouri. George Anderton was the husband of Charlotte's daughter, Sarah Eliza Wawne. David Gill was a brother to Charlotte and to William Gill. He has been described as the less successful of the two brothers. There are three more pages to the letter but there is no Vernon County information in it. Charles Wawne, did make it to the Dakota's as mentioned in the letter. There is an 1885 Dakota Territory census that lists Charles and his family living in Cass County. The birth places of the children tell us that Charles Wawne had not lived in Vernon County long enough to have any children born there. 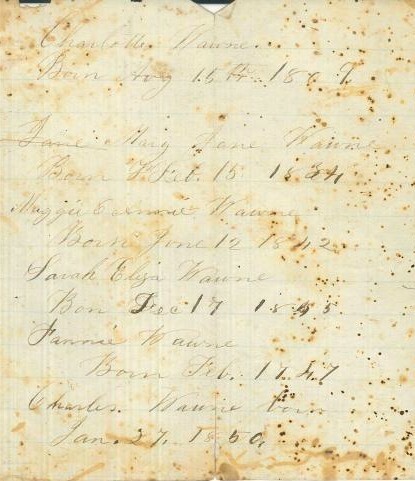 Although the letter is not specific, it is probably reasonable to assume that Charlotte and Fannie had gone to Missouri some time after the 1880 census was taken. We don't know if they went WITH Charlotte's son Charles or if he was already there and Charlotte and Fannie went to join Charles and his family in Vernon County. We also don't know for certain that 79 year old William Gill went to Vernon County with them or if he was there at the time of Charlotte's death. We do know that he paid for her grave marker at Gill Cemetery but we also know he died in 1889 and was buried in Bunker Hill Cemetery at Bunker Hill, Macoupin County, Illinois. His wife Malinda had died in 1879 and is buried beside him. What about the "other" Gill's that lived in Vernon County? According to an online reference (Johnson, Bernice E. "Place Names In Six Of The West Central Counties Of Missouri." M.A. thesis., University of Missouri-Columbia, 1933), the Gill School was named after a J.F. Gill, "a local." His father, one Charles W., born in VA, appears in the 1880 census as living and farming in Moundville. His parents according to the records, were both born in VA. According to MO marriage records, he married Elizabeth Jane Shanholtzer (daughter of Bushrod and Rachel Shanholtzer) in 1872 in Vernon County. Further evidence that Charles Gill lived near the town of Moundville is that when his wife Elizabeth died on September 1, 1881, she was buried at Moundville Cemetery which is a half mile west of the town of Moundville. In the 1896 school enumerations, two Gill children were listed with Mr. and Mrs. Bushrod Shanholtzer. It shows James Gill, and Alice Gill living with their grandparents in English School District, which was about a mile north of Bronaugh. This must have been referring to Alice and Edgar Gill, since the other children would have been beyond enumeration age. There is one other Vernon County reference to this line that is of note. A burial in Welborn Cemetery, northeast of Moundville is listed for the infant, John F. Gill, who had been born January 17, 1892 and who died February 4, 1892. He was the son of J. F. and L. Gill. In summarizing these two Gill families, although both lived in Vernon County, there appears to be no relationship between them. The first families discussed lived in very Southwestern Vernon County on land that included Gill Cemetery and Gill School. The other Gill family lived near the town of Moundville which was not very close to either Gill Cemetery or Gill School. So what about that 1933 Master Thesis claiming that Gill School was named after J. F. Gill? I will state my opinion here and if someone comes up with proof otherwise, we can discuss it. To say that Gill School was named after J. F. Gill, appears to have to have no basis in fact. In the first place, J. F. Gill was born in 1872 and the school appears on the 1876 plat map. So it is highly unlikely that he would have founded a school at age 4. Also, J. F. Gill never lived near the school, his mother was not buried at Gill Cemetery and his infant son was not buried at Gill Cemetery. 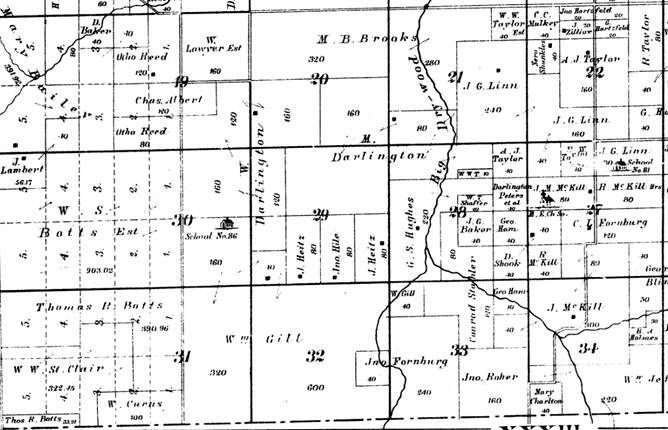 It appears much more probable to say that J. C. (John Curry) Gill (and probably with his father William Gill) was responsible for donating the land for both the cemetery and school since they were on a corner of his property in the 1876 plat map and that he lived there according to the 1880 census. He would have children old enough to need a school in the 1870's and up until the time that he left for the Dakotas. The information here is open to discussion but it will take strong proof to convince me to not be of the opinion that Gill Cemetery and School were named after someone other than John Curry Gill and his father William Gill. If you have information or photos to share or questions please let us know. This page was supplemented by information from Gill descendant Donald Hebert and by Vernon County expert Nancy Thompson.